Goddess is set to be released on December 15th. Keep in mind, she is not part of the subscription service, so you’ll want to snap her up quick. Click on the headline for all the images. Discuss on the Toyark Forums› Views: 5161 › Credit: Eurocoin of the Toyark Forums! 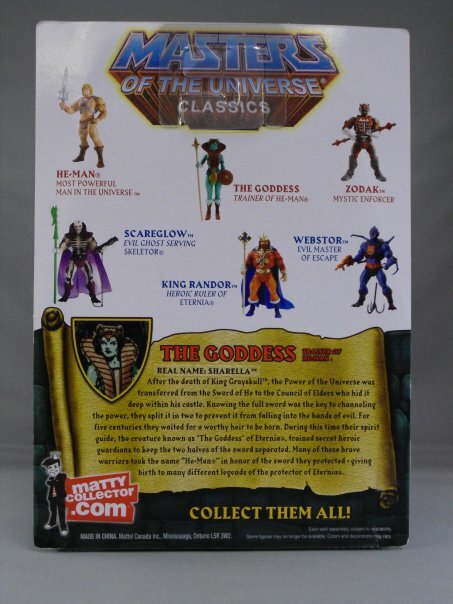 Mattel has revealed new pictures of the packaged (green) Goddess figure on their Facebook page. Check out the Goddess in all her glory! This fan demanded figure comes out this December 15th. Note that she is not included in the 2009 subscription, so if you want to add her to your collection, move fast! 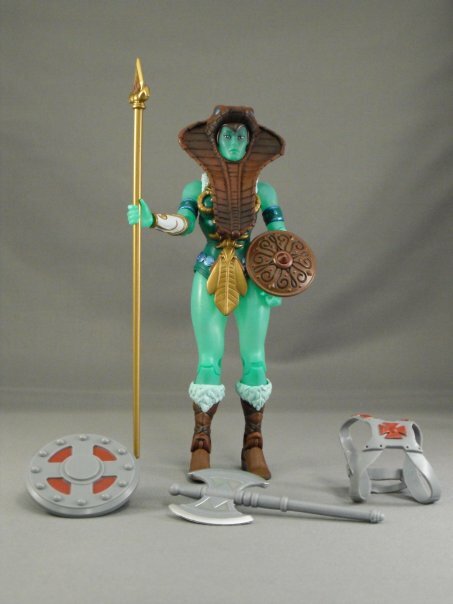 Goddess comes with removable snake armor, corodite armor, power shield and Grayskull's axe to train her warriors as well as an all new staff of the Elders. Catch her before she magically disappears! Package back with new bio and classsic art! Check out the transulcent skin! It is amazing!! After the death of King Grayskull, the Power of the Universe was transferred from the Sword of He to the Council of Elders who hid it deep within his castle. Knowing the full sword was the key to channeling the power, they split it in two to prevent it from falling into the hands of evil. For five centuries they waited for a worthy heir to be born. During this time their spirit guide, the creature known as "The Goddess" of Eternia, trained secret heroic guardians to keep the two halves of the sword separated. Many of those brave warriors took the name "He-Man" in honor of the sword they protected - giving birth to many different legends of the protector of Eternia. A green teela? I'm not a huge fan of the mold to begin with, but this version is pretty cool. She looks neat, but the snake armor keeps throwing me off. On her and teela both. It just keeps reminding me of the snake men. Yeah, I think this one is a pass for me, that is if I could ever get my hands on a figure from Classics in the first place! Funny you should mention that, since it should. According to Teela's card back, the armor she wears was used by the Snake Men during the war with Grayskull. What I've wanted to know since the 80's is where (and who) are the Snake Women that could actually wear the armor? Those of you who've tried to put the old armor on Kobra Khan or King Hsss know what I mean. I think she looks cool. 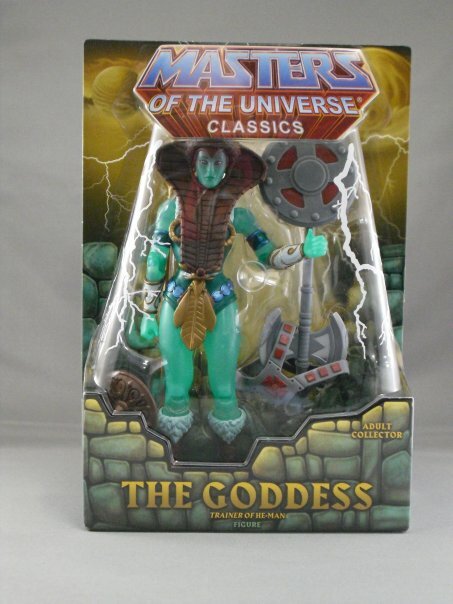 I wasn't a big He-man fan back in the day so I didn't know who Goddess was but I like the translucent fig. 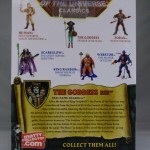 I'm going to use the head with hair for Teela and keep Goddess with the snake armor to help differentiate them. I was more a cartoon guy so I'll keep Teela the way I remember her. In the case of the Goddess, it was felt that if a Goddess figure was made in the vintage line, she "would have" used Teela's head and headgear. They just "never made" the Goddess in the vintage line... (well you get what we mean). Does that make sense? Hopefully this clarified and didn't make things muddier! I was going to pass on this one since it's basically Teela, but the translucent plastic looks very cool. WhatI always say is, even though if you don't like it still pick it up. You can use it later down the road as trade fodder. It's twenty bucks, and once it's out it only becomes a better bargaining tool. Video review should be up later tonight, or early by tomorrow. Be careful- they break. Her leg fell right off. She is beautuiful. NOW my version she was a magical nature Nymph forced to serve the Evil Goddess of the Snakemen...a GIANT female Nagini Cobra- with indestructable skin. Scary and dangerous. Hordak contacts Sharella and gives her a dark magick poison to take and kill the immortal Snake Goddess from the inside (where vulnerable)- when consumed....Hordak LAUGHS that she has to make the ultimate sacrifice. The poison makes Sharella seem extra delicious and Nagini consumes her WHOLE! The Goddess is born! with greater powers....and armour..
What do you think of my legend?